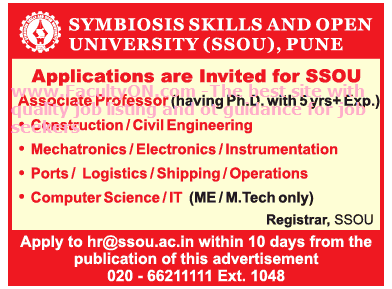 Symbiosis Skills and Open University, Pune has advertised in THE TIMES OF INDIA newspaper for the recruitment of Associate Professor jobs vacancies. Interested and eligible job aspirants are requested to apply within 10 days from 11th July 2018. Check out further more details below. University Profile: Symbiosis Open Education Society (SOES) was established to promote vocational, skill based education and open & distance learning. SOES has four constituent units under its aegis - Symbiosis Centre for Distance Learning (SCDL), Symbiosis Vocational Junior College, Symbiosis Community College and Symbiosis Institute of Skill Development. SCDL was established in 1994 with the objective of “Reaching the Unreached". Salary: As per University norms. How to Apply: Interested and eligible candidates are requested to send CV along with copies of certificates and recent PP size photo to the following email address.